When Susie Coston first opened up the barn, the stench was so foul that it made her eyes burn. Visible thanks only to the small patch of light coming through the open door, countless pairs of fearful eyes peered back at her. She turned on her flashlight and walked inside. Ribs and spines showing through their mange-ridden skin, a herd of pigs was crowded into the small structure, standing on years’ worth of their own feces. Some were crammed into small wire cages with no room to move, while tiny piglets were scattered among the adults, getting stepped on and injured. Most of them couldn’t stop coughing. Many weighed just half of what they normally should, and some had deformed limbs or injured hooves. And this was only one barn. Coston and the Farm Sanctuary rescue team kept opening up barns and sheds on the New York property during the rescue this weekend — and each discovery was just as harrowing as the last. 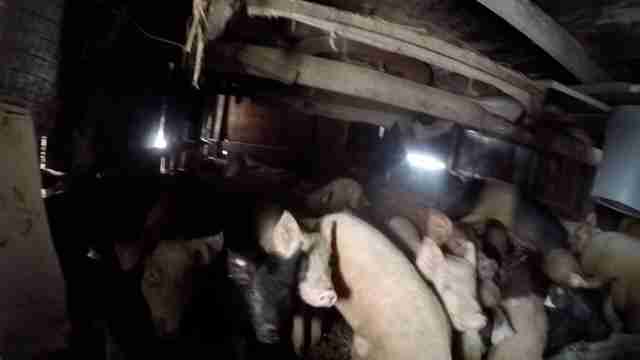 In total, 85 pigs were living in similar conditions across the multiple enclosures. 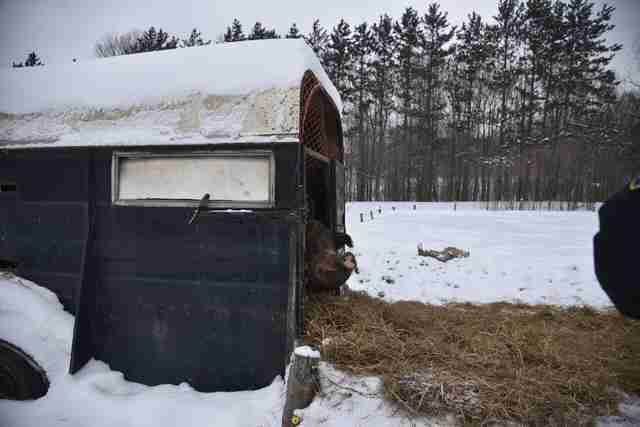 One herd, which was living outside, had a small trailer as their only shelter. 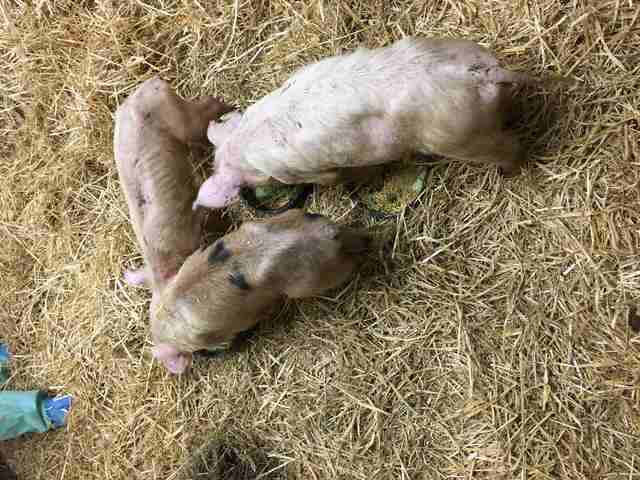 Many of the females were pregnant, and it was unclear how many piglets had succumbed to the cold before rescuers arrived. 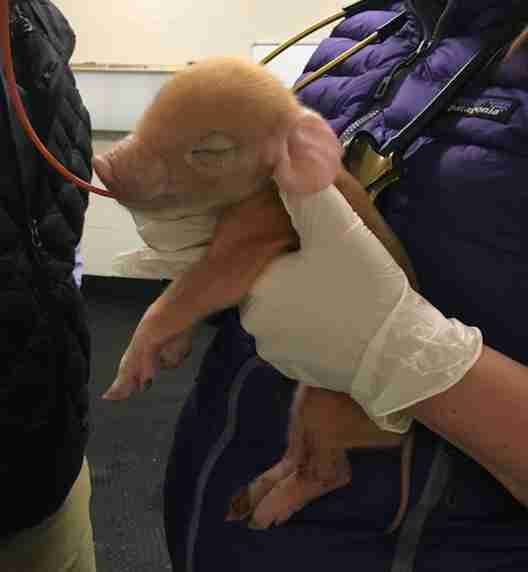 Identifying the pigs with the most dire health concerns, Coston and the rescue team loaded 24 grown pigs and newborn piglets into their vans for emergency veterinary care. They also took in four sickly chickens. While it’s unclear why the animals were being kept, Coston said it’s likely they were being raised for food. Some animals were taken to Farm Sanctuary’s Watkins Glen campus, while the more severe cases went to Cornell Veterinary Hospital for around-the-clock care. 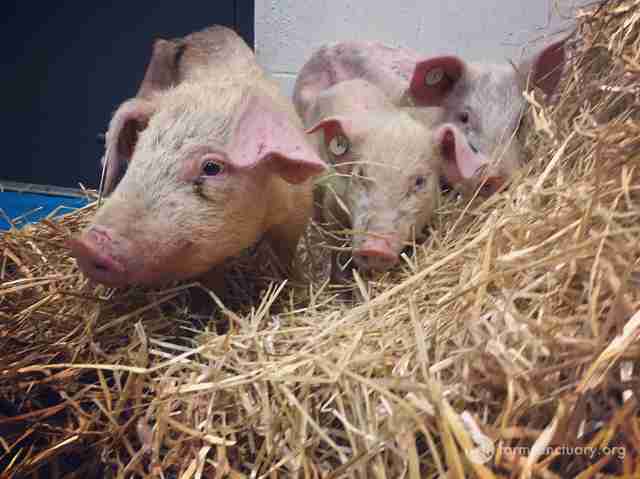 All of the pigs are suffering from pneumonia, and many have very advanced cases of worms and mange. 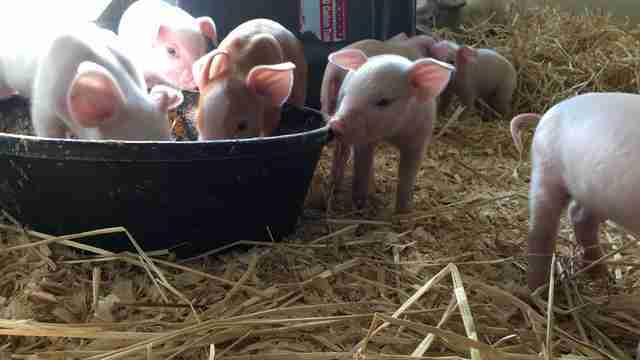 In addition to the 24 pigs rescued by Farm Sanctuary, the SPCA has seized the additional animals from the property. Both organizations are closely monitoring the pigs and have begun treating them for their many ailments. While the piglets are adjusting well, many of the older pigs are fearful of their new environment given their prior lives in darkness, with little to no human interaction. On rescue day, it was clear to Coston how attached the pigs were to one another — especially the siblings. 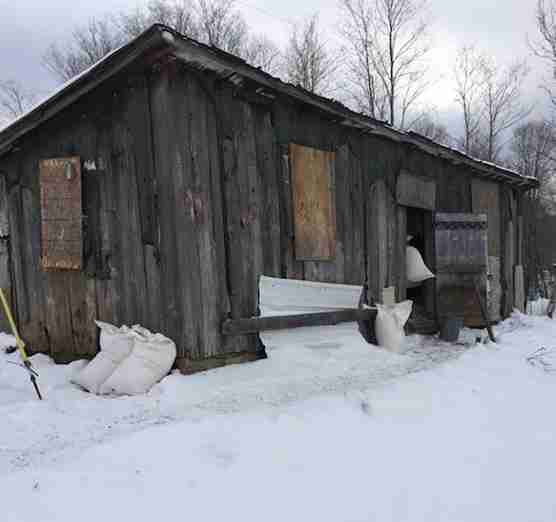 While the owner of the property has been arrested, this was not the first time the sanctuary has been called to rescue animals from the same farm. 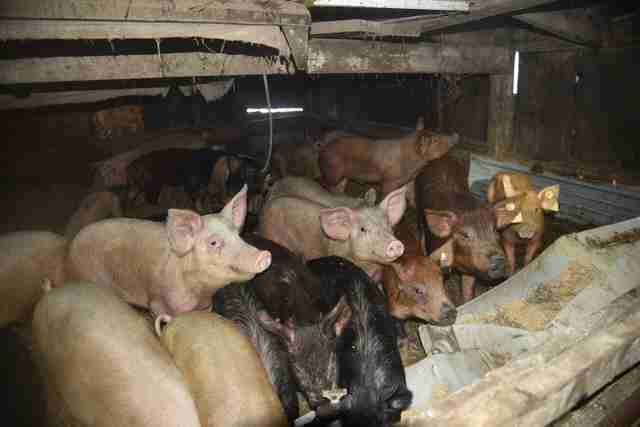 In 2003, local SPCA officers arrived at the property to follow up on a complaint and found over 100 pigs living outdoors with no food or shelter. Many of them were suffering from frostbite or were frozen to the ground, Coston said. The owner, Jerry Nason, was sentenced to three years probation and was barred from owning any animals for that time span. While formal charges for Nason are underway, Farm Sanctuary will continue working to help local law enforcement with the investigation. 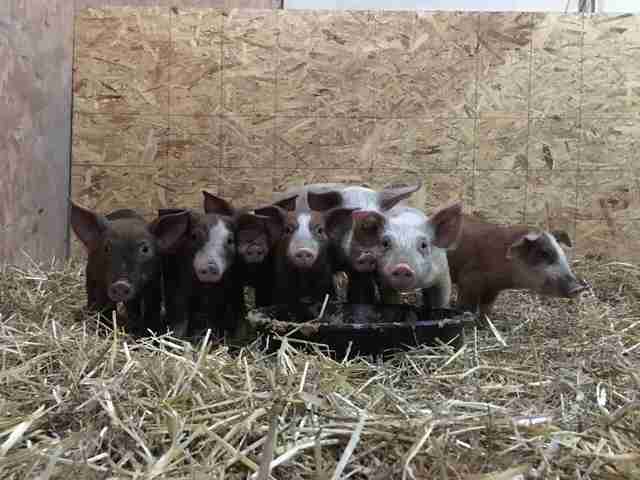 To help cover the rescued pigs’ medical bills, you can make a donation to Farm Sanctuary.